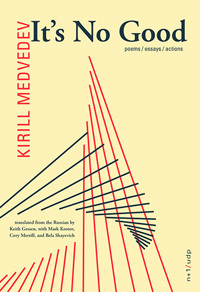 The form of Medvedev’s poetry is free verse, which is a bit unusual in the Russian poetic tradition (his early influence was Charles Bukowski, whom he translated). His tone is contemplative, confessional. His poems are written in contemporary colloquial language spoken by educated Russians with an occasional trespass into mat. His overarching subject is the collapse of human norms all around him. He shocks by understatement, by talking some general theme we could all relate to and then, with a slight twist, he makes us see how around us the awful, the appalling became the usual, the expected. He is also definitely a poet of Moscow, of her specific neighborhoods, streets, Metro stations, clubs and taverns. In the meantime, the literary establishment’s advice to poet is to: “concentrate on finding novel ways of becoming stale”. It’s powerful stuff, Medvedev’s poetry. A few words about Gessen’s translations—they are excellent. It might seem that speech-based free verse would be a translator’s dream. It isn’t. Speech cadences differ so much from one language to another and yet, for such poetry, they make all the difference between a poem that grabs you and a poem that stands there. Gessen succeeds brilliantly. Even where he strays, he adds and not subtracts. Describing a sordid domestic drama, Medvedev writes of “something out of Dostoevsky, with no garnish”; Gessen translates “something out of Dostoevsky with no chaser”, and it works–drinking does go with such drama much better than food. The originals of Medvedev’s poems can be found at kirillmedvedev.narod.ru; his LifeJournal account is zoltan-partosh.livejournal.com; and you can see him reading his poetry at a recent protest rally in Moscow here. Julian Berengaut was born in Warsaw, Poland where he started his university education. He continued it in Jerusalem and the US. He has published book reviews, poetry and, most recently, a novel “The Estate of Wormwood and Honey”, The Russian Estate Books, 20012.